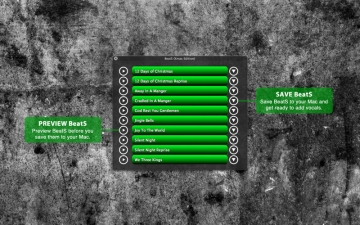 [無料] BeatS (Xmas Edition) | Mac App Storeのアプリ検索・ランキング BuzzMac! BeatS was put together by extraordinary people with vast music industry experience who have a great appreciation for music and pay attention to detail. In addition, these individuals appreciate the need for world-class instrumentals for professional record making hence this app. All BeatS where produced using cutting-edge sequencing software alongside live session musicians and also using high quality grade samples. • It has never been easier and effortless to kickstart your music career or better yet impress your friends with Chart-Topping Quality BeatS. • Audition BeatS before you save them to your computer - find the BeatS that resonate and fit with your needs and style. • Transfer your BeatS to your Mac and get ready to lay vocals.